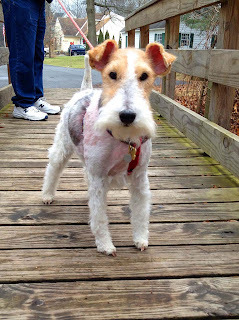 The adventures of Luna "The Scruffy Yacht Dog" our Wire Haired Fox Terrier. Hello to all my furry kid friends. I'm 6 years old today. I had a great Birthday. Mom gave me a nice steak bone to chew on and before she left for work she gave me a snoozel, it's a pigs face rawhide. These are some pictures from New Year's, I had just been stripped. I really hate that. There have been a lot of changes since I last posted. I am no longer the Scruffy Yacht Dog. Mom and Dad decided to sell my sailboat so Sailor Dance is now back in the Chesapeake Bay where she originally came from. They even sold the Zodiac, which was my favorite. 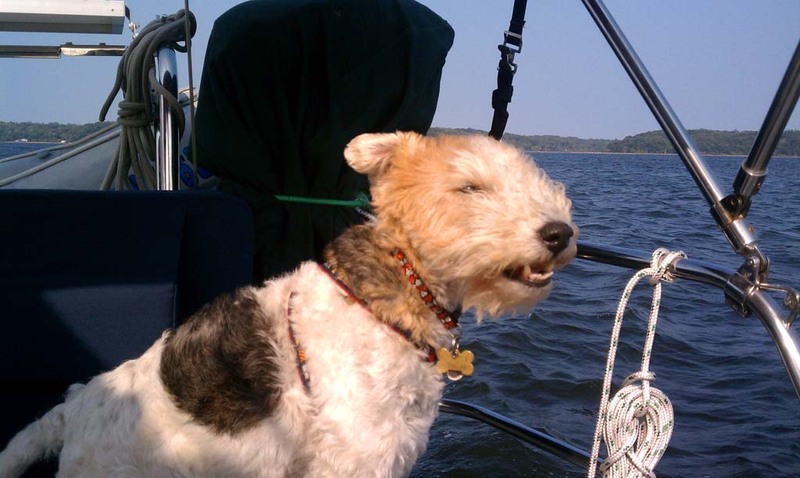 Here I am with the wind in my fur on Labor Day weekend at Oyster Bay Harbor. One of my last days on the boat. 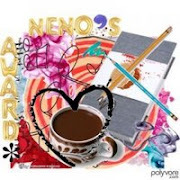 Gotta run, I will try to write more often. 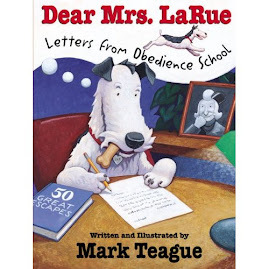 Your friend Luna the "Scruffy Land Lubber"
Happy birthday, Luna! Your steak bone sounds pretty yummy to me. I'm sorry to hear about your boats. I've never even been on a boat before. Luna, I haven't seen you since Bear Mountain! You look wonderful! 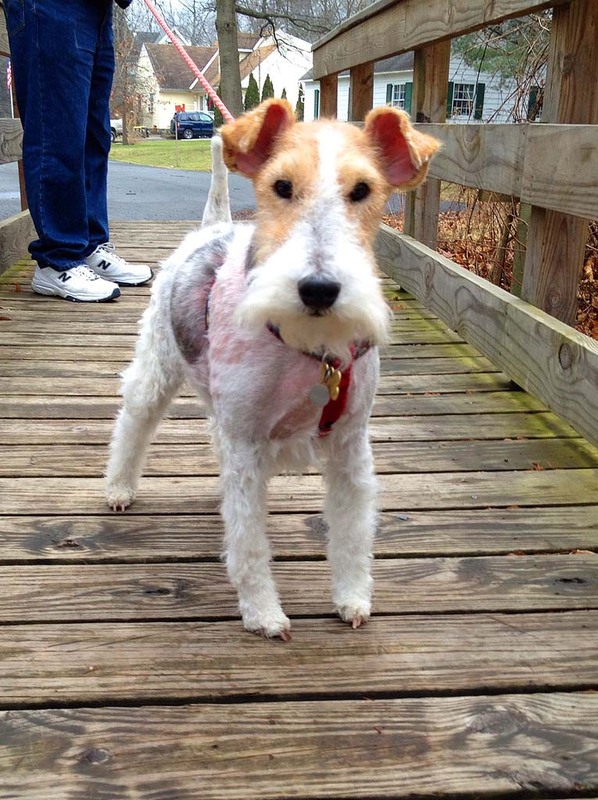 Hi – Will you please post a link to your Blog at The Wire Fox Terriers Community at vorts.com? Our members will love it. 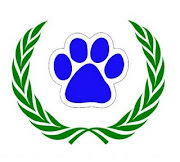 Members include: WFT Owners, Breeders, Rescues and Lovers. I am a female Wire Haired Fox Terrier. Born February 3, 2006 at Thornton' Wires in Clermont, FL. Lynn and Carl Comstock, my wirey Mom Stella and my wirey Grandma Madeline raised me for the 1st 8 weeks of my life. My wirey Dad is Smithy. My new Mom Joan came down from New York and picked me up. We spent a few days in Jacksonville visiting with GG and then it was off to New York on a jet plane. You know what its like to ride under a seat for 3 hours? When we landed in New York, my new Dad John was there to meet us. Mom and dad are great parents. They have given me a great home, actually 2 great homes. In the summer I spend a lot of time out on my sailboat. I rule the roost here only they don't know it. On those occasions when I mis-behave I'm too cute for them to stay mad at me for long. Chewing a bone while sitting on Mom or Dads lap. Taking a nap on the sofa and not getting caught. Playing in water or with water. Putting my paws in other dogs water bowls. Going out on my sailboat, nothing like the wind through my hair. Pulling paper out of the garbage pail, Mom and Dad are not so fond of that. Shredding any paper I pull out of the garbage pail, Mom and Dad are not so fond of that either. Barking at people walking past my yacht. Doing my dancing bear routine in the kitchen, especially if I might get human food for the performance. It doesn't always work, but I try. Stealing scrunchies out of Cassies bathroom. ME AND MY BOYS ON DECK!